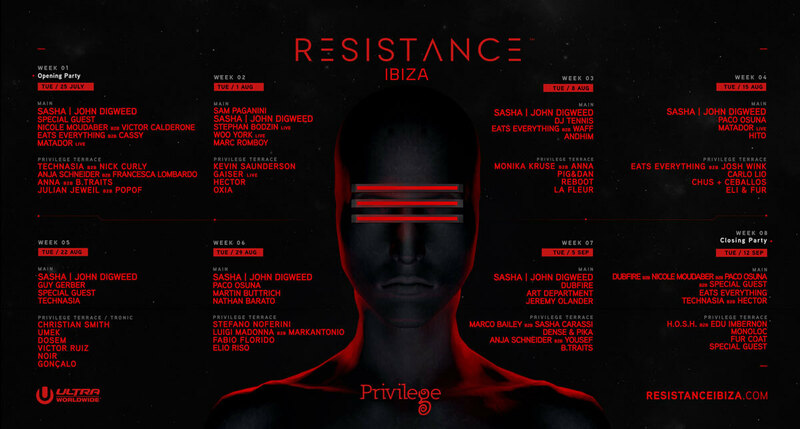 With just over a month to go until the grand opening on 25 July, RESISTANCE™ now announces the final lineup and weekly programming for its landmark residency at Privilege Ibiza this summer. Set to run every Tuesday until 12 September, RESISTANCE™ IBIZA will be headlined by Sasha & John Digweed (exclusive Ibiza residents) for seven of the eight weekly parties, as the brand prepares to bring over 60 of the most diverse names in the house and techno scene to the world’s largest club this summer. Debuting on 25 July, RESISTANCE™ IBIZA’s Opening Party will see the brand making a splash on the White Isle right from the start, with Sasha & John Digweed set to be joined in the Privilege Main Room by Eats Everything b2b Cassy, Matador (Live), Nicole Moudaber b2b Victor Calderone and one very special guest. The Privilege Terrace will be a full-on b2b affair, with Anja Schneider b2b Francesca Lombardo, Anna b2b B.Traits, Julian Jeweil b2b Popof, and Technasia teaming up with Nick Curly. The Closing Party will then see RESISTANCE™ go out in style, as Dubfire, Nicole Moudaber, Paco Osuna and a special guest ALL GO B2B for a marathon closing set, with the likes of Eats Everything and many more set to perform. A further 10 names have also been added to the schedule across the summer, with Art Department, Edu Imbernon, Fur Coat, Gaiser (Live), Hector, H.O.S.H., Jeremy Olander, Monoloc, Oxia, Pig&Dan now confirmed to join the likes of Andhim, Dubfire, Francesca Lombardo, Guy Gerber, Kevin Saunderson, Marco Bailey, Martin Buttrich, Paco Osuna, Sam Paganini, Stephan Bodzin, DJ Tennis and many more. View the full lineup and program here. Tickets for all eight Ibiza parties are now on sale at ResistanceIbiza.com.